The biopic has become a staple of the awards season release schedule. In October this year, two high profile titles, First Man and Bohemian Rhapsody, entered into cinemas looking to court both audiences and members of the Academy. 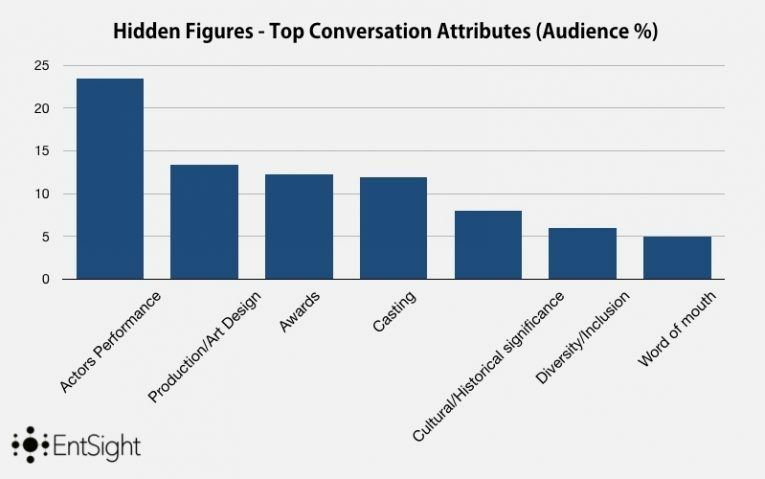 But do audiences merely see these films as Oscar thoroughbreds designed to bring home a multitude of statues for their leading men and ladies or do they also recognise a wider significance to the genre? 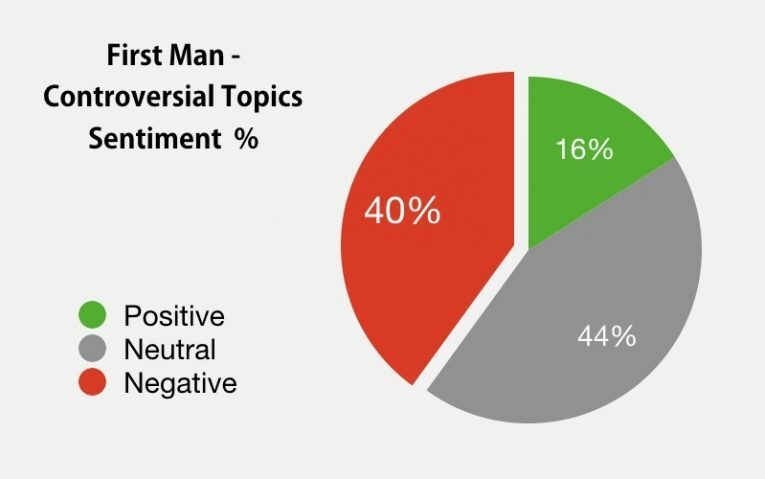 Using our film analysis tool, LimeLight, we have examined the conversation surrounding several celebrated biopics of this and previous years to ascertain what aspects of this Oscar-baiting genre resonate most with movie-goers. 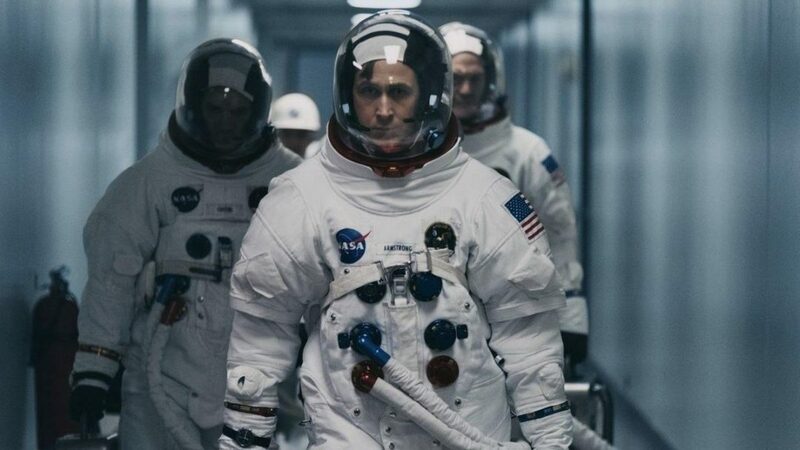 By looking at a general overview of the three titles we have decided to cover - First Man, Darkest Hour, and Hidden Figures – we can already see a distinct picture as to how audiences perceive and respond to biopics. It is clear that the overriding attributes in the conversation around these three biopics are “Awards” and “Acting Performances”. This is fitting since it is within the acting categories at the Oscars this century, biopics thrive like no other genre. 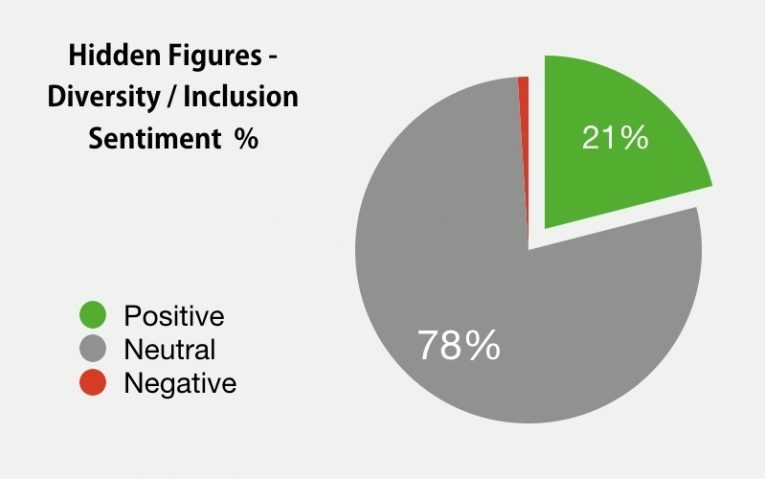 Of the 68 acting Oscars awarded for 21st-century films, 31 of them have gone to actors and actresses playing a role based on a real-life person. This is particularly pronounced in the leading actor category in which 11 of the last 17 awards have gone to the male lead in a biopic. And nowhere can see an audience’s reaction more focused on this than in Joe Wright’s Winston Churchill biopic, Darkest Hour, from 2017. At this year’s Oscars ceremony, acclaimed British actor Gary Oldman finally won what many felt was a long overdue acting gong for his portrayal of Britain's war-time Prime Minister and it seems that the audience saw little else in the film beyond that purpose. 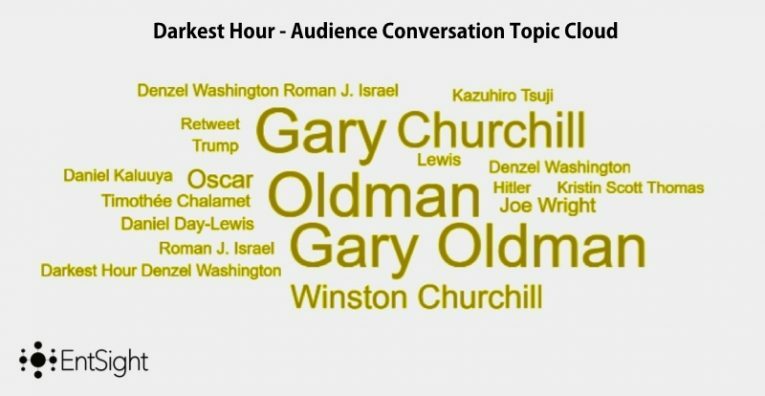 We can clearly see how focused the conversation was on Gary Oldham’s Oscar chances in response to the film not only by the actor’s and his character’s prominence in the above word cloud but also in the presence of this year's other Best Actor contenders - Daniel Day-Lewis, Timothee Chalamet, Daniel Kaluuya, and Denzel Washington – all gaining equal attention to the film’s director, Joe Wright, and Gary Oldman’s co-star, Kristin Scott Thomas. 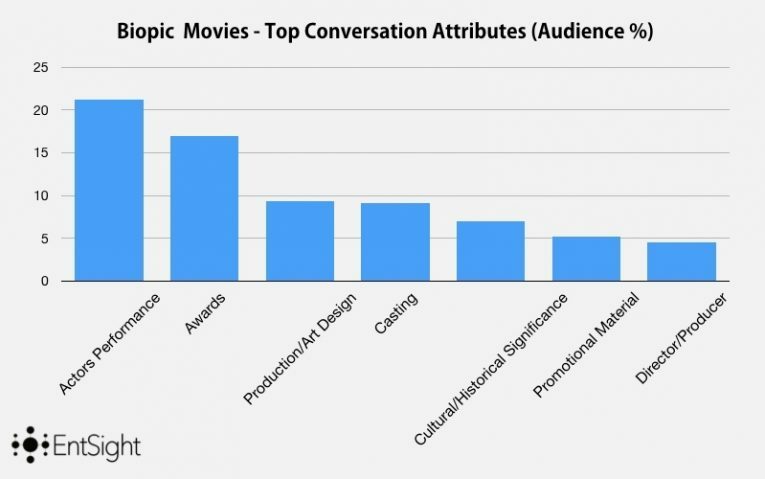 While the perception of biopics as awards vehicles is undeniable and justified, it is important to stress that audiences are not completely focused on these factors as our other two examples demonstrate. 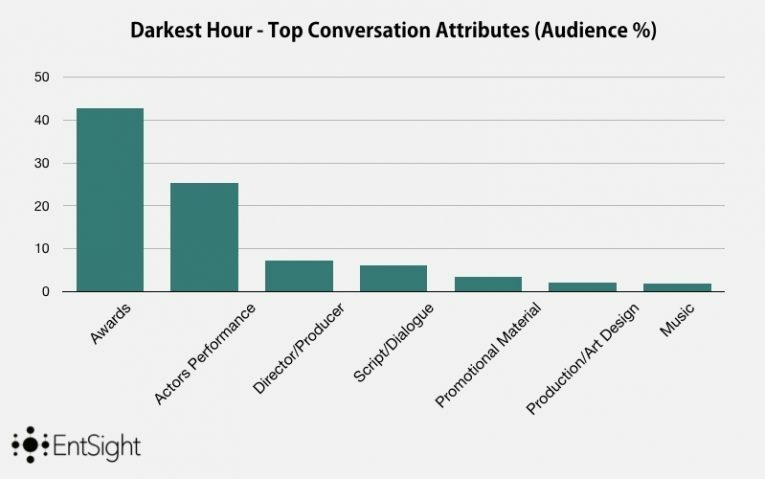 The purpose of LimeLight is to give the clearest overview possible of which particular aspects of a film generate the most attention from audiences. 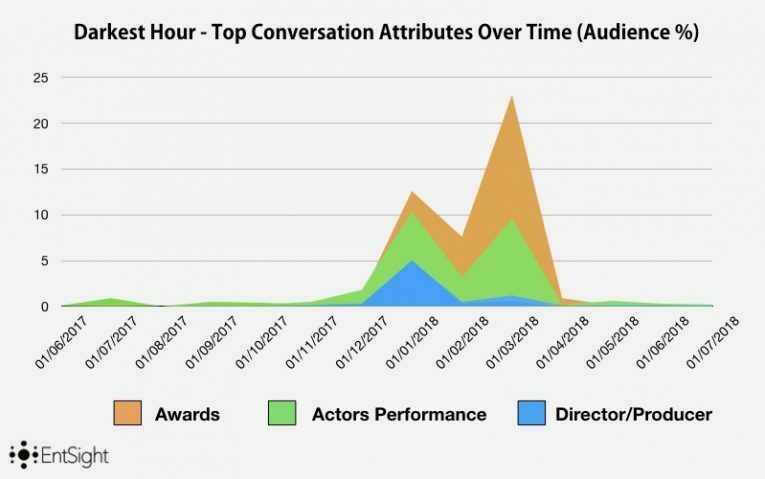 Even in a genre which is so often focused on the leading actor and the real-life character they are playing, LimeLight is able to demonstrate that audiences are sometimes looking beyond those factors. Another important aspect of biopics is the cultural, political and historical significance of their subject matter, but this is something that can swing both ways for a biopic’s fortunes. 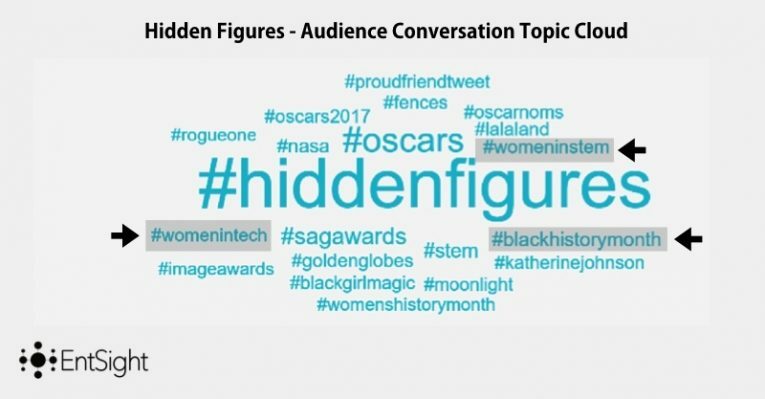 These fortunes are perhaps best exemplified by two recent biopics concerning the first moon landing in 1969 - 2016’s Hidden Figures and this year’s First Man. 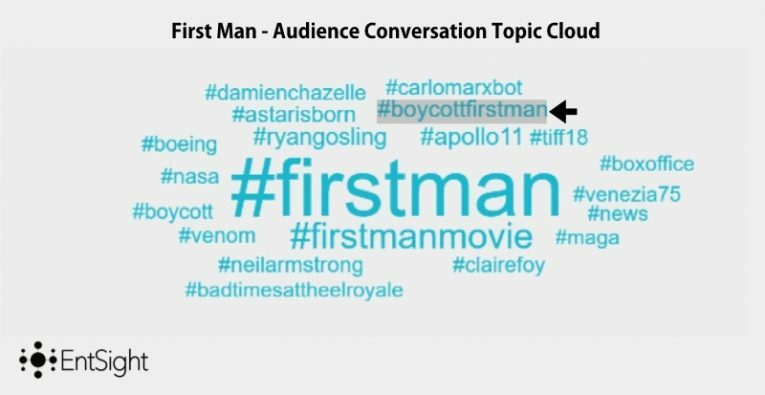 However, in the case of the other moon landing biopic, First Man, LimeLight demonstrates that the film’s Cultural/Political/Historical significance did it few favours at the box office. 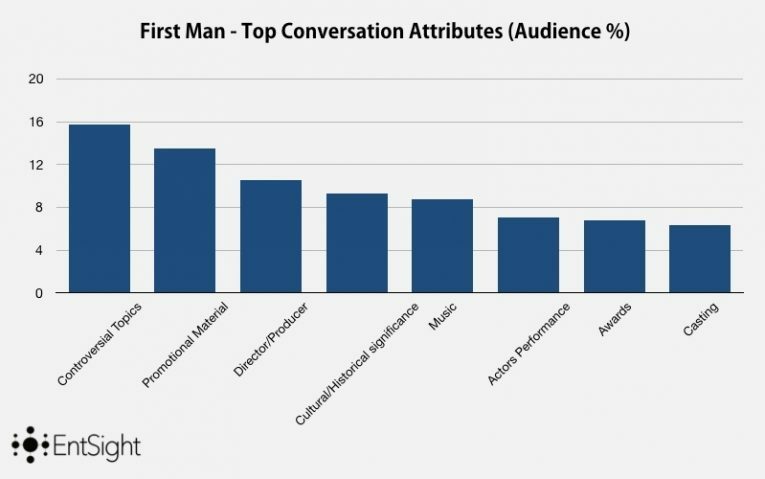 While Damon Chazelle’s Neil Armstrong biopic was praised by critics and had a major promotional campaign behind it, First Man has failed to generate the expected box office takings (it has taken a meagre $32 million domestically in its first three weeks of release) for the first major big-screen adaptation of the first moon landing. So it seems the box office fortunes of biopics are just as subject to the political whims of the so-called culture wars as any other genre; however, their undeniable awards potential may mitigate any collateral damage of this in the eyes of producers. And as LimeLight shows us that while audiences may recognise this aspect of biopics above all else, they are also responding to many others within the genre – whether that be to a biopics betterment or not.